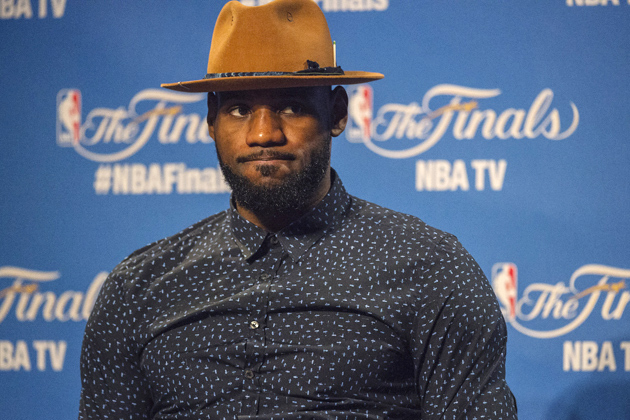 LeBron James found himself on the wrong side of NBA Finals history ... again. Here's why the Golden State Warriors winning this season's NBA title shouldn't define his legacy with the Cleveland Cavaliers. CLEVELAND—The best basketball player in the world was a picture of misery: towel on his head, hands on the towel, wraps on his knees, feet in an ice bucket, none of it moving. LeBron James had given every second he could, from every blood vessel he had, and his team had lost in the NBA Finals. Again. 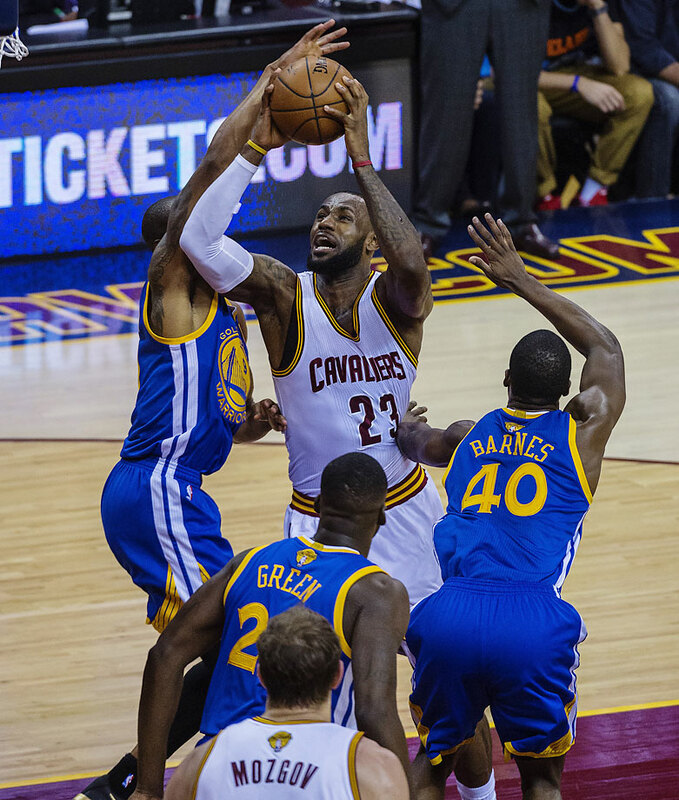 Yet even in a 105–97 Game 6 defeat Tuesday night, even exhausted in the corner of the locker room, James was the star of the scene. His agent, Rich Paul, huddled with him. Teammate Iman Shumpert addressed a media pack, then went to hug LeBron. Teammate J.R. Smith said he “absolutely, absolutely” wanted to be back in Cleveland next year, then hugged LeBron. 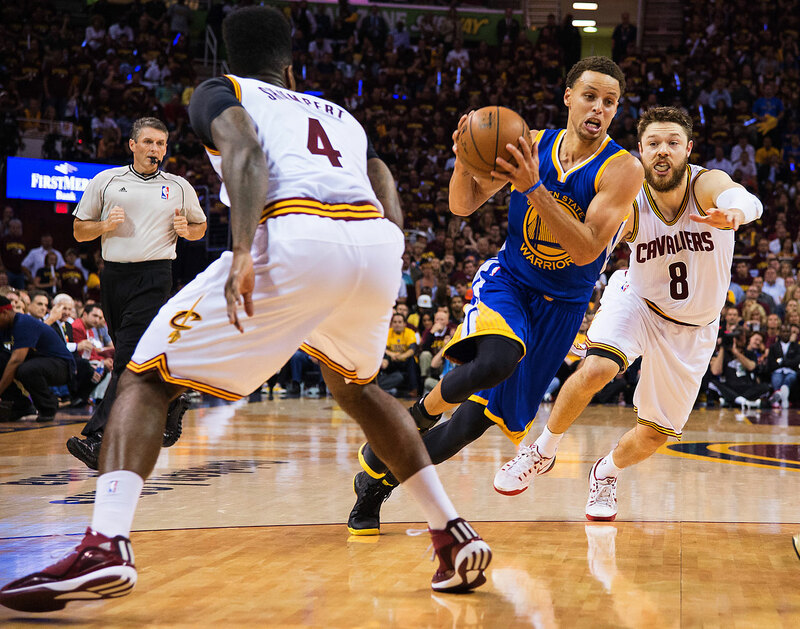 Spunky point guard Matthew Dellavedova answered a few questions, then shook LeBron’s hand. Cavs owner Dan Gilbert walked over, dressed in his everyman billionaire outfit of Cavs T-shirt and sports coat, and said goodbye to the very entourage that drove him to the brink of madness five years ago. When James returned to Cleveland last summer, everybody understood that his second Cavaliers stint would be a failure if he didn’t win a championship. 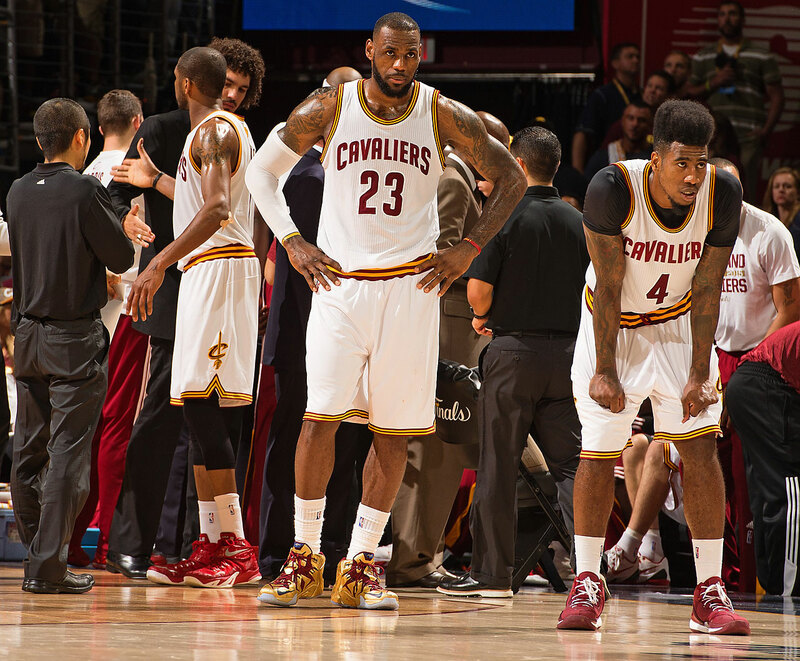 This series proved what his first run in Cleveland proved: He cannot do it alone. 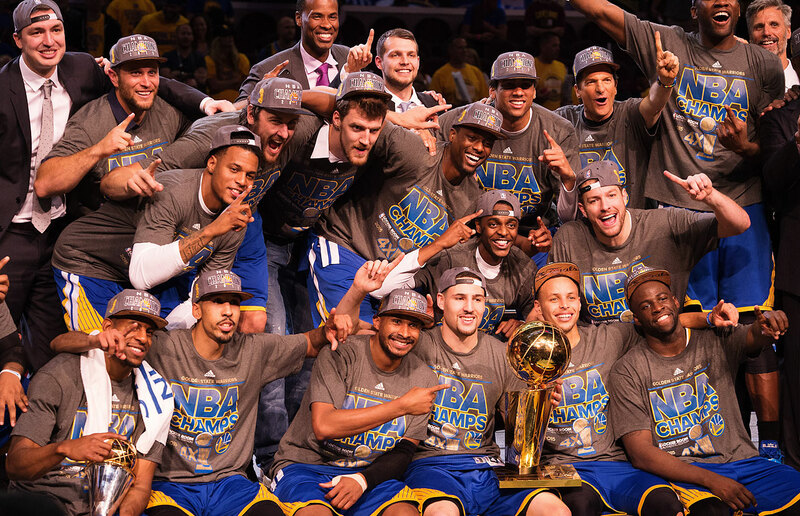 As the Warriors collected the Larry O’Brien Trophy, the scoreboards here read: THANK YOU FOR A MEMORABLE SEASON. Some days, that seems like enough for this town. Outside the Cavs locker room, a security guard tried to stop three young men from passing through until one of them explained: “We play for the Cleveland Browns.” That was all the guard needed to hear. 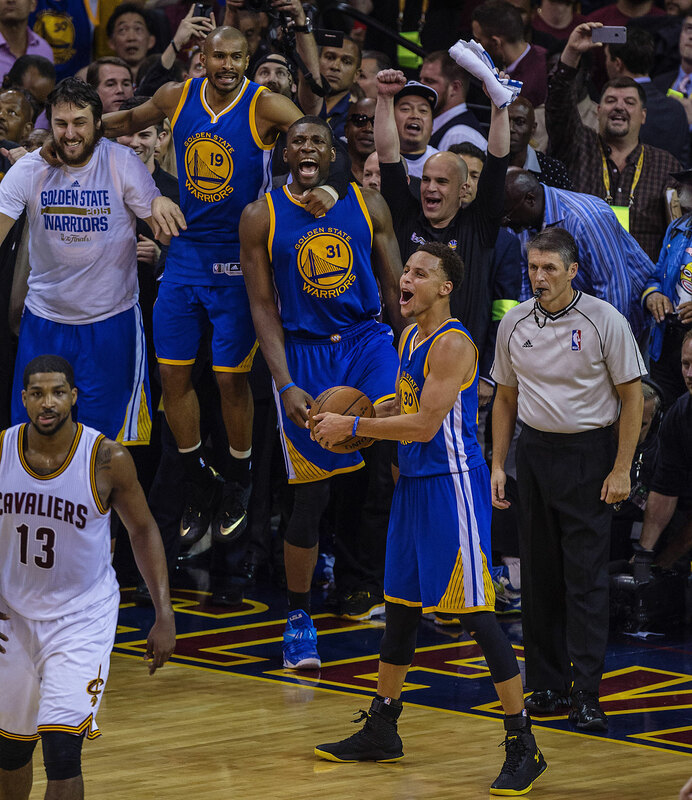 If you play pro sports in Cleveland, you are a hero. You don’t even need to win a championship … unless you are LeBron James. His talent raises expectations, even in his own mind. He admitted that sometimes he asks: “Would I rather not make the playoffs or lose in the Finals? I don’t know.” But he added that “then I lock in,” and the joy of competition takes over. Mostly, though there is this: Iguodala said he skipped his gameday nap because he was too worried about what LeBron might do. Do you think James lost any sleep over Iguodala? He should have won the Finals MVP. But what would he do with it anyway? Jerry West won the Finals MVP award when his Lakers lost to the Celtics once. Do you think he looks back on it with any emotion besides searing pain? Millions of words are used every day to describe LeBron James, yet so much is lost in the forest of opinions. We focus on what doesn’t matter. Earlier in these playoffs, he said he had an extra, personal motivation for winning this championship, which led to stories and debates about exactly what that motivation was, and you know what? Who cares? Paul thinks James lost the Finals MVP between Games 5 and 6, when he said he didn’t want to win the MVP unless he won a championship: “When he made that comment I think that kind of tipped it.” Paul is probably right. We have made a sport of using James’s words against him. James is so good that we assume everything should be easy for him, and when it isn’t, we hold that against him. In that sense, maybe losing this series will be for the best. Maybe Kyrie Irving will be healthy next spring, and even if Kevin Love leaves via free agency, maybe the Cavs will win the title. It would mean even more then, because it was hard. James knows this from experience. After the Mavericks beat James’s Miami Heat in the 2011 Finals, James went to the Bahamas with two of his best friends, Paul and Dwyane Wade, and their significant others. Paul later said they talked "about a lot of things. It was a good conversation amongst men.” He told them: Your time will come. There is no need for that conversation now, no need for the trip. As Paul said, “I don’t think that’s necessary.” James is much more comfortable with himself, as a basketball player and a public figure. He has led two teams to championships. He did everything he could with this one, and he will do whatever he can with the next one. When he said, after Game 5, that he was confident because he is the best player in the world, he spoke the truth. The rest of us can yap about this nebulous concept of his “legacy.” It doesn’t seem to affect him anymore. He has lost four of his six Finals, and if we see that as his “legacy,” the problem is with our eyes. There has never been a basketball package like him. Are we really going to pretend that Iguodala is more valuable, or more of a winner, just because Iguodala gets to play with Stephen Curry, Klay Thompson, Draymond Green and Harrison Barnes, while James had to play with guys the Knicks didn’t even want? How shallow are we? 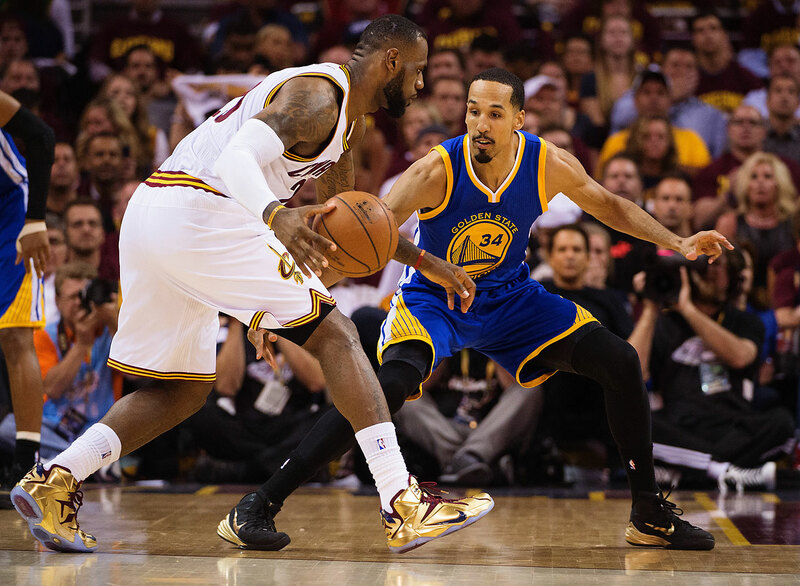 [daily_cut.NBA]He was the most valuable player in the Finals, breathtaking to watch. Five years ago, he ran from the burden he was assigned; he left Cleveland for Miami and an easier path to titles. If you hated that, you have to admire what he did this past year, and especially this spring. James said he did not think the Cavaliers would lose until they had actually lost. Paul talked to him after Game 1, when the Warriors won in overtime and Irving broke his kneecap. He embraced the challenge then, even though it seemed impossible. It has. No doubt. And yet, this is a sign of how much James has grown, and changed: He doesn’t seem to be fighting for respect any more. He doesn’t seem so concerned with outside validation. Opinions are just opinions, and some will always tilt against him. The game is his work, and he knows he did good work. He also knows it wasn’t enough. With every passing year, it will be harder for him to summon greatness. Going home to win a championship was a nice story, but nobody is going to give him that championship. All the respect he earned in this series is just one big opinion, and really, so is the Finals MVP award. No wonder he wasn’t that concerned about it. He wants a championship. After his press conference, James walked deliberately toward the Quicken Loans Arena loading dock and out toward a long summer. It was the middle of the night, yet he wore sunglasses. He talked briefly on his phone, then said his goodbyes to his friends and slid into the driver’s seat of a white Mercedes. Moments later, Thompson walked from the loading dock back into the arena, still wearing his game shorts, socks and sneakers, looking like he wanted the night to last forever. 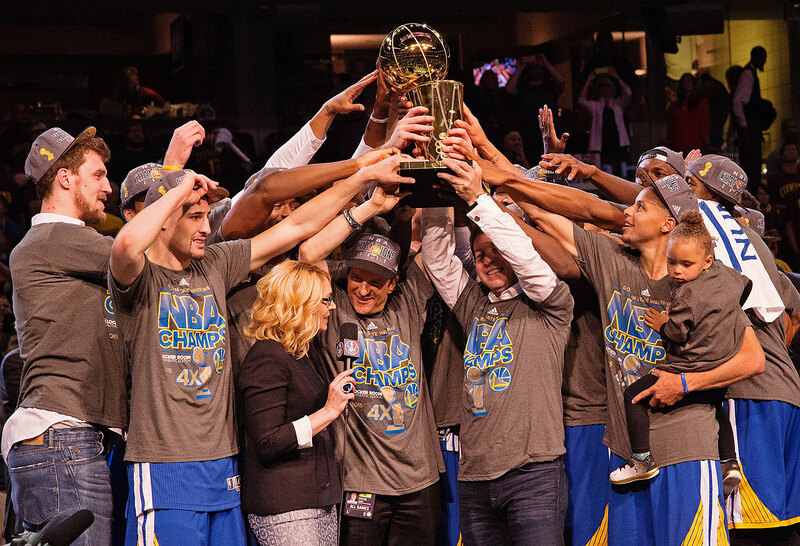 The Golden State Warriors won Game 6 of the NBA Finals 105-97 over the Cleveland Cavaliers to clinch the franchise's first NBA title since 1975. 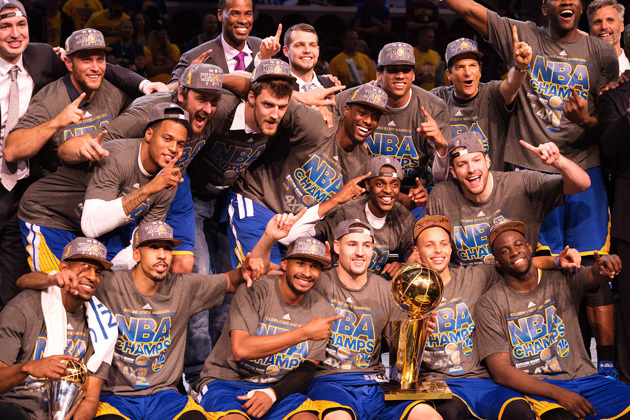 The Warriors are the third straight one-seed to win the title, following in footsteps of the San Antonio Spurs in 2014 and the Miami Heat in 2013. 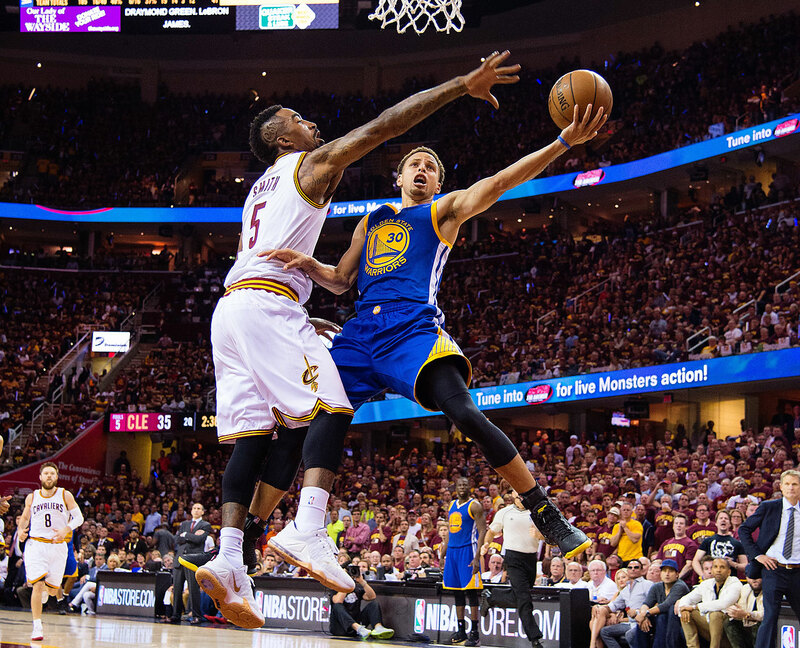 Golden State trailed by two points early in the third quarter but quieted the crowd in Cleveland, which has seen the city's three pro teams go a combined 144 seasons without one of them winning a championship. 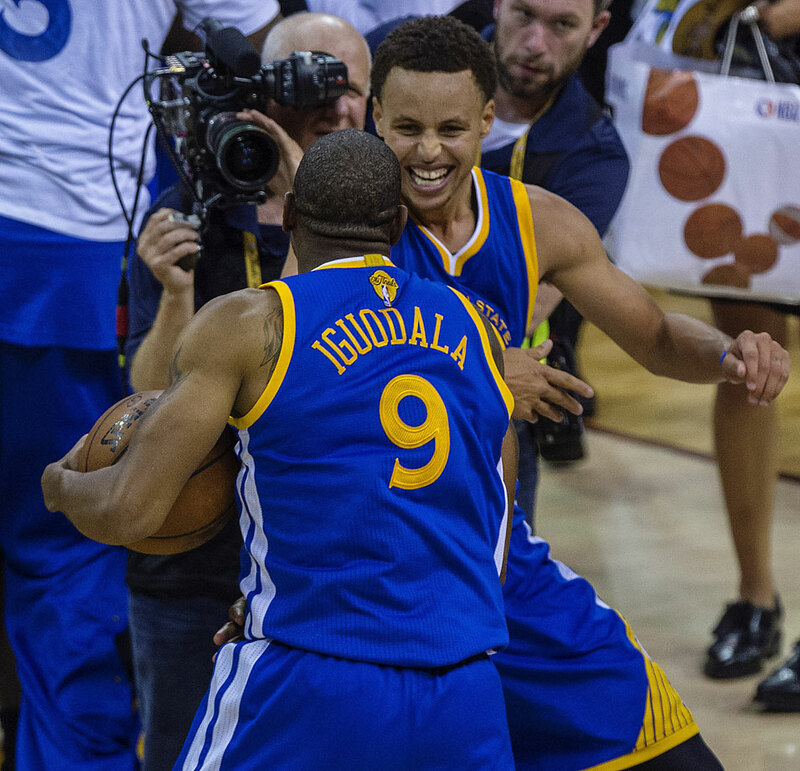 Andre Iguodala was named Finals MVP and celebrates here with regular season MVP Steph Curry. 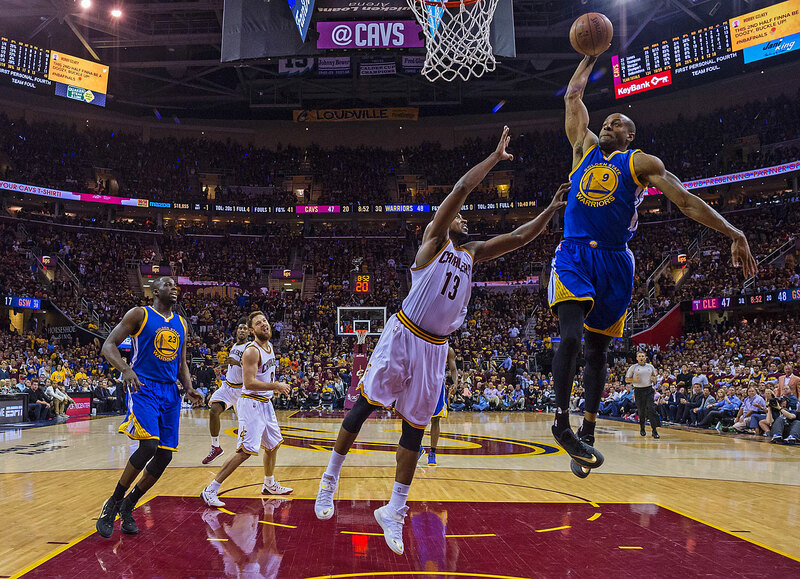 Inserted into the Warriors starting lineup for the first time all season in Game 4 of the NBA Finals, Andre Iguodala proved his worth by helping lead Golden State to three consecutive wins and the title. He scored 25 in Game 6. 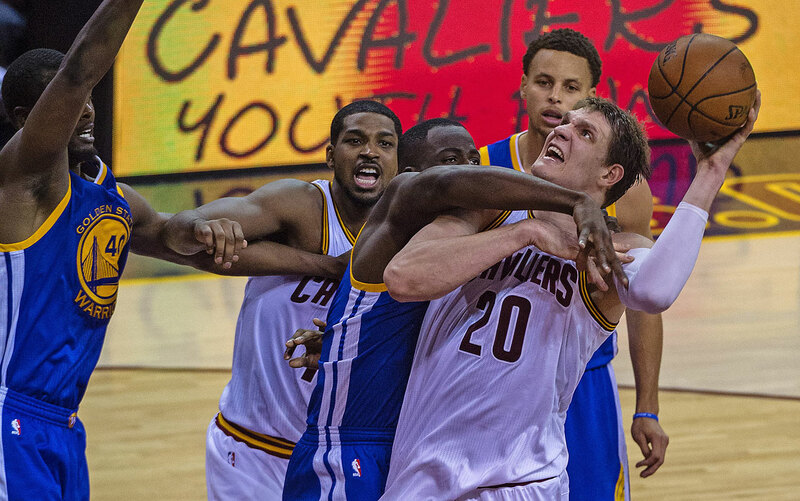 Draymond Green, pictured here holding down Timofey Mozgov, enjoyed a triple double in Game 6 -- 16 points, 11 rebounds and 10 assists. 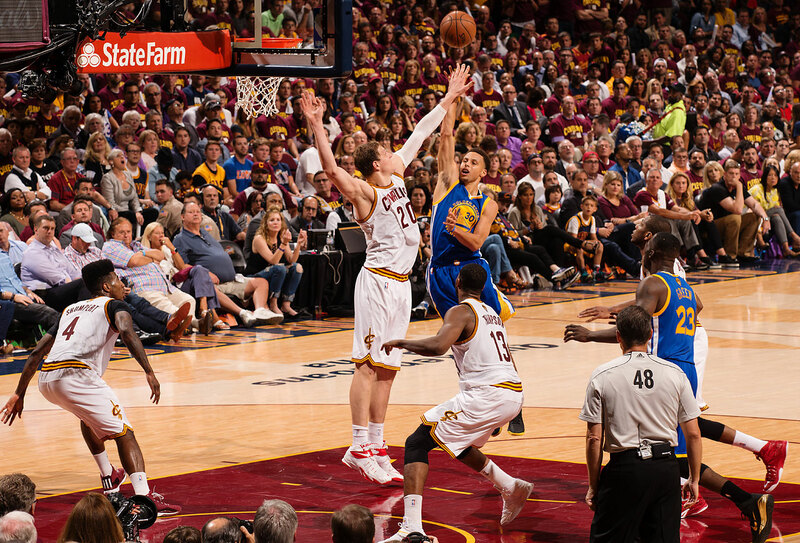 Steph Curry goes to the left hand to score two of his 25 points. 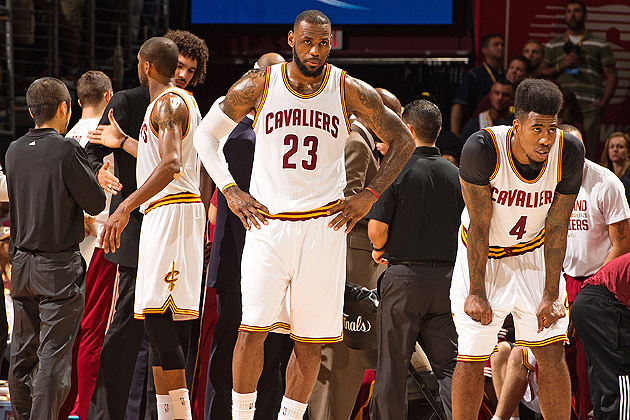 LeBron James had 32 points, 18 rebounds and nine assists in the losing effort. 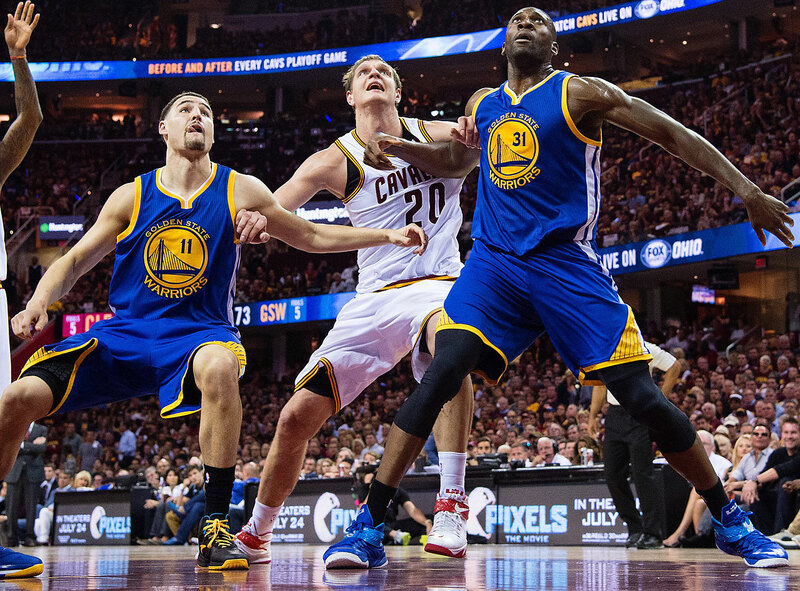 Klay Thompson scored five points for Golden State before fouling out late in the fourth quarter. 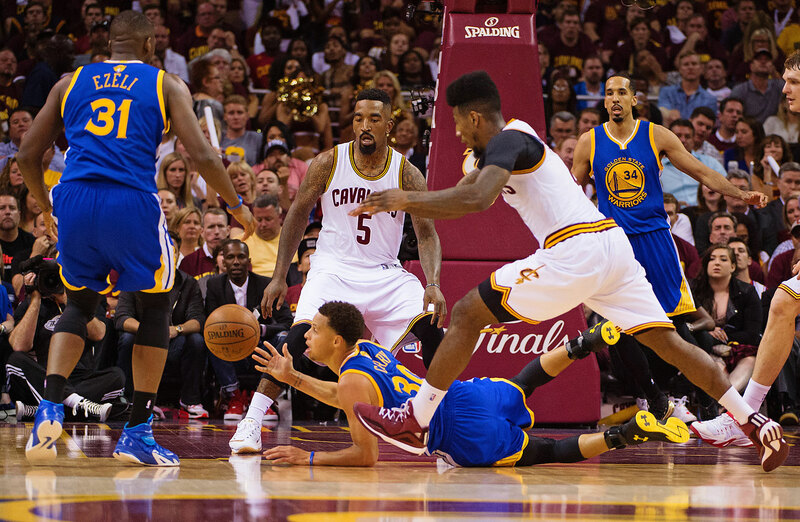 Cleveland outrebounded Golden State 56-39 in Tuesday's game. 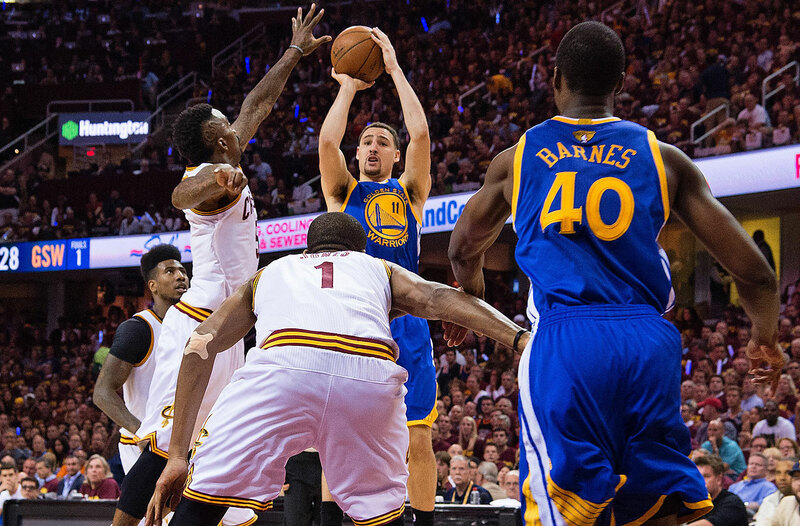 Steph Curry made only three of his 11 three-point attempts and hit eight of 19 overall. 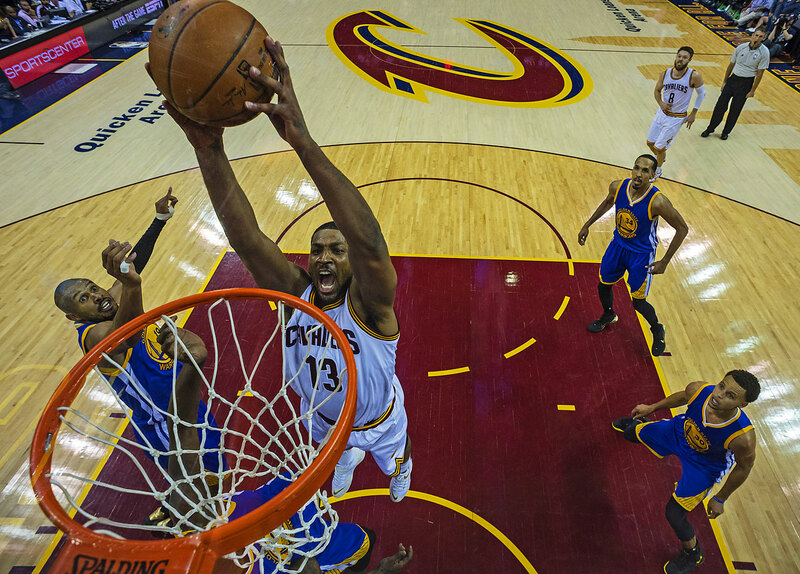 Tristan Thompson throws down two of his 15 points. 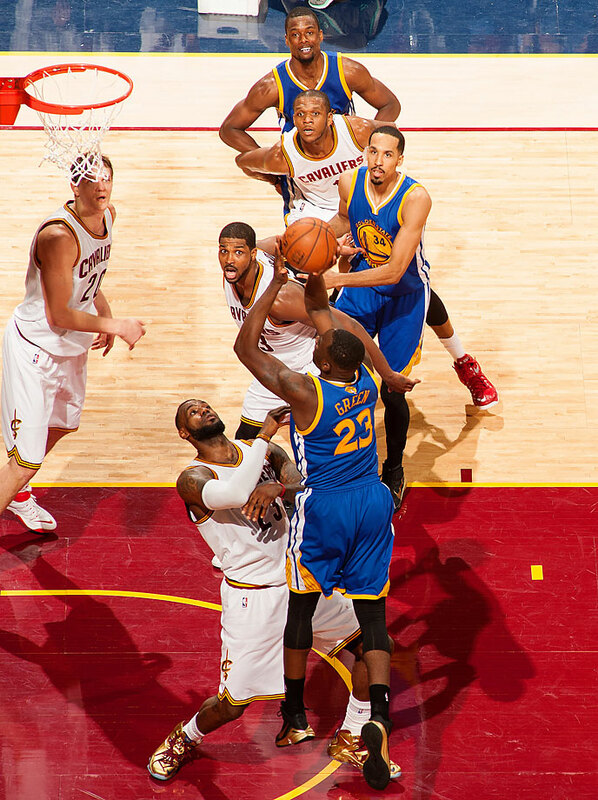 Draymond Green muscles up over LeBron James, who has now lost in four NBA Finals. LeBron James returned to Ohio this season to try to end Cleveland's title drought but didn't have a strong enough supporting cast after season-ending injuries to Kyrie Irving and Kevin Love. 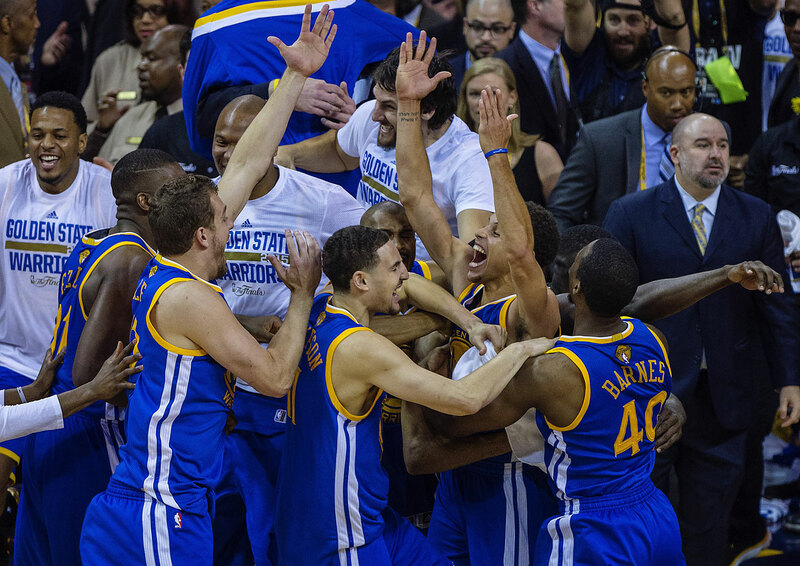 Steph Curry, the Warriors' first MVP since Wilt Chamberlain, hustled from start to finish in Game 6.